A good interviewer always tries to make the interviewee/candidate comfortable and relaxed during the interview. Try to make the interview more like a discussion and not an inquisition. Most candidates feel the awkwardness and the nervousness when they first attend the interview, the main purpose of the interviewer is to make the candidates feel at ease and also ask them questions and validate them whether or not they are fit for the job. Keep in mind that asking too many questions one at a time can shake the concentration of the candidate and can make them feel intimidated. It also limits your goal of finding the right person for the position. As an interviewer, try to be a bit more active and cooperative during the interview. Cooperation from both the sides of the candidate and the interviewer is needed. Try to prepare a few questions beforehand, if possible. This is necessary so as to keep the interview go smoothly at a steady pace. The first thing that the interviewers are supposed to do while starting an interview, is to make the candidate feel welcomed and comfortable. Do not start the interview by just asking a bunch of questions immediately. Instead, introduce yourself first and enquire about them, ask them how their day was and then slowly get into the main topic. Being too rushed in an interview will stress the candidate and will also affect his confidence and also his performance. Also, try to be friendly and make an effort to keep a formal attitude towards the candidate. Each person has their own specific behaviour, traits and characteristics. Try to learn more about how they behave in a typical day and how they manage their time effectively. This allows the interviewer to decide how judiciously and productively the candidate is spending their time. Another goal that can be achieved by asking such a question is that the interviewer can get an idea of how the candidates apply the knowledge that they have acquired through studying and understanding in their daily life through their activities. If a candidate is able to describe themselves through their actions rather than stating a bunch of mere beliefs that they have for themselves, then it is easier to judge a person and decide whether or not the candidate is perfect for the job. It also shows how genuine the candidates are during the interview. Ask questions that are more forward and will produce honest answers from the candidate. For example, ask them what all plans they have for the holidays or about their plans for future studies, are they interested to go to a foreign country or if they have any plans to develop their skill set in the future. This shows how much the candidate is interested in studying and tries to improve. Also, try to look for that amount of energy and enthusiasm in which the candidate is answering such questions. This shows how genuine and honest the answer is from the candidate. The candidate should be very much excited to improve himself on a day by day basis and should try to prove that he is an asset for the company and not a liability. Most recruiters ask questions to candidates that are open ended and cannot be limited with monosyllables like a simple “yes “or “no”. Moreover, interviewers should try to ask more and more follow up questions to the candidate so as to keep a momentum going on. Ask the candidate to explain certain situations from their past experience and ask them to state what all measures they took to achieve a satisfactory result. Always ask a “how” question, in relevance to the candidates’ various events and experiences. This allows them to talk more about the topic and at the same time, feel less shy and awkward about the interview. Asking dumb questions is not an issue in modern day interviewing. Asking the candidate to explain the abbreviation of something he said and asking them to explain the simplest of things is both beneficial for the candidate and the interviewer. This makes the candidate more comfortable and will make them feel like they are the master of the topic. Also, it will help them to increase their ego in a positive way. This way, the candidate will be more enthusiastic in explaining questions when asked. Also, for interviewers, another tip is that, if they feel any doubt or you feel that you need clarification for a certain part of the question, then do not skip to the next question immediately. Instead, try asking the candidate further explanations and clarifications so that you get a clearer picture of what the candidate is trying to answer. Try to ask direct and pointed questions to the candidate. At the same time, to prevent the interview being too serious, try to ask some light hearted questions as well. The interview should be seen as a friendly yet an authoritative figure. If the interviewer is too friendly, it loses the seriousness of the interview. 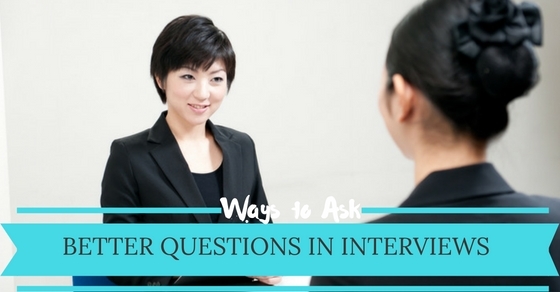 At the same time, if the interviewer is too strict and demanding, then the interview becomes similar to an interrogation and the candidate feels reluctant to answer questions. It is always better to ask a bit serious questions, when the seriousness is under a certain level of moderation. Also, add some funny questions to lighten up the mood. This is a great method to tailor your interview questions according to the candidate and can enable you to ask questions with relevance to the atmosphere of the interview. Asking a myriad of questions can also help you to steer the direction in which the interview is supposed to go. The success in an interview lies in how much information you can dig up about the candidate. This means that you should ask as much questions as you can in a systematic manner. Try not to ask too many questions at one go to save time. This makes the candidate confused and also it prevents the candidate to answer the questions honestly. Instead of asking a long question in a single stretch, try to ask questions in parts or split the questions into more than two. Also, ask follow up questions if necessary. Try to keep in mind that the direction of interview should not deviate from the main purpose of the interview. When questions are asked in a slight accusational mode and digging deeper into the failures of the candidates life, can make them more defensive about their methods and they may not answer the question honestly. Try to be less accusing and more empowering. Encourage the candidate to think beyond their limitations and ask questions that are more open ended. Try not to ask why the person did not achieve his goals, instead ask what all obstacles were present. This encourages the candidate in being more honest to the interviewer. Asking the tone of the questions results in a change of tone while answering from the candidate. Also, asking empowering and encouraging questions can allow the candidate to share more information to the interviewer. Try to ask opinions instead of reason. The candidate will feel more at ease when sharing sensitive information. While asking questions, try to get an answer that is very much comprehensive and broad minded. The candidate should know how his answer should be with respect to everyone in general and is not just all for himself. Try to ask questions that will encourage him to think things in an open minded manner and also regarding with the actions and feelings of others. Try to make them reconsider how they think, perceive and understand others. Try to ask questions that seeks a link with everyone. This shows whether or not the candidate is a leader or a follower. Also, include “have you ever” type of questions. This allows the candidate to think about situations that not only apply to himself but also to the rest of the group. Make questions that enable the candidate to stretch out their perspective and vision on topics and would make them feel comfortable in sharing information to the interviewer. The main problem of many interviewers is that they tend to not ask questions where the answers are already known to them. They simply try to follow the assumptions made by them about the candidate based on the candidates’ first impression. Sometimes, assumptions overpowers the questions and they leave a few questions unasked. Do not try to do so. Instead, try to ask questions as much as you can and try to extract as much information as you can about the candidate. You will be surprised to find out that a majority of the assumptions that you make about the candidate will turn out to be false. Try not to hold back when asking such questions, this might restrict the candidate from answering honestly. Asking generic questions in the same manner will eventually lead to getting generic answers. Instead, try to paraphrase the common questions in such a way that encourages the candidate to think both sides of the question. This allows the candidate to provide a well-polished question that is both satisfactory and justifiable. Ask questions that the industry normally faces and you will be surprised to hear effective solutions from the candidates. Asking why questions also aids up to an extent. Asking such questions will also help large companies to take into consideration certain factors that can be responsible for a positive change for the organisation and the industry. The right type of questions allows the candidates to think about the situations and problems more effectively. From the interviewers’ point of view, try to ask questions up to a specific level until you find the satisfactory answer. Try to use the power of silence that will allow you to seek more effective answers for the questions asked. Many professionals use silence as a method to procure satisfactory answers. Try to be comfortable while asking a question, pause for a while to allow the candidate to think about the questions and try to hear out what the candidate has to say. Also, give them time to pause and think about more points during answering. If you wait for a minute, you will get the answers that you were hoping for, from the candidate. Also, this method should be effectively used while asking short and simple follow up questions. The candidate will also try to fill the pauses occurring from their side by providing relevant information. When a candidate is answering your question, try not to interrupt what they are trying to convey as they feel it is disrespectful and rude from your side. This will also make the candidate more irritated and hostile during the interview. Also, interrupting them suddenly would also disturb their train of thought and also will steer the direction of the interview to their favour. This will result in a more biased result. If you have any doubts what the candidate is trying to say, politely stop him and ask him the doubt. This will make the candidate feel that you are carefully hearing and understanding what they are trying to say. Hence, it will create a positive atmosphere for both the candidate and the interviewer. But if the candidate is deviating away from the main point of the question being asked, then it is your obligation to interrupt the candidate and bring them back to the question. Try to research about what kind of information you want to ask and formulate questions that will extract as much information as possible from the candidate. Keep in mind that asking the best questions in an interview requires a lot of skill and practice. Try to incorporate effective techniques to produce good interview questions.